You provide print-ready files incl. calendar grid: If you are a designer or you have a print ready file you can simply upload your own calendar artwork. You can also use our free calendar templates that include calendar grids with holidays for each month. You find detailed information about calendar layouts and file preparation here. Calendar Layout Service: You want to make your own calendar but you don't have a print ready file? Let us do the hard work for you! Based on your images and our free template we will set up your personal calendar including cover, backside and standard grid for each month. Just choose your desired calendar type, configure the available options and place your order. Any images you deliver must be of printable quality. You will be able to review your file and ask for improvements twice. To find out your calendar's correct page count and layout suggestions, please go to calendar layouts in our Help Center. When setting up your pages for calendars, you must set them up as single pages (not as spreads). You can use a thicker paper stock for the cover sheet (front cover and back cover). Detailed information about Calendar Layouts and File Preparation here. Calendar file templates including monthly grids for 2018 / 2019. Calendar printing is a way for brand recognition in the advertising world. The more times a business can get its information in front of a customer, the greater the odds of new or repeat business. No better method of doing this works as well as when you make your own calendar. Cheap calendars printing services can provide the best option for making sure that customers see your name and logo every day. When you make your own calendar, you can customize the pictures and information so that customers are constantly aware of the services you offer. Services that offer cheap calendar printing make it simple to order these unique marketing tools, and they will give detailed instructions to guide you through the process as you make your own calendar. Some calendar printing companies will even send sample packets to businesses. 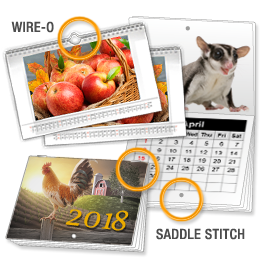 Once you have decided on pictures, logos, font, type of paper, and other business information that you want to include, cheap calendar printing services make ordering easy by providing templates to use. We offer all common calendar sizes with a template including a monthly grid with holidays. This takes all of the stress away as you make your own calendar. Have a look at our calendar layout page to get an impression of the different calendar types, their designs and how to set up the correct page orientation. Once the finished product has been created, agencies can send it to a cheap calendars printing company online. The completed order should be in your hands within two weeks, and your company name can be all over town in a short time.